At Choonara Orthodontics, we are passionate about helping our patients achieve healthy, beautiful smiles that last a lifetime. Dr. Choonara and our highly trained team of orthodontic specialists take pride in using only the most advanced orthodontic technology at our office, ensuring your treatment is convenient and as effective as possible. We have years of experience helping patients in Johannesburg, Sandton, and surrounding areas reinvent their smiles - and many of those patients are busy, professional adults. No matter what your age, it’s never too late to improve your oral health and overall appearance with adult orthodontics. You may think braces are "just for kids," but think again! A new smile improves your oral health, overall health, and appearance, and there are a host of psychological benefits to straightening your smile. Plus, healthy teeth can be moved at any age - so you're never "too old" for braces. The benefits of orthodontic treatment are significant and wide-ranging. 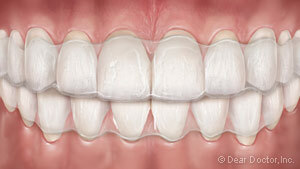 Straighter teeth are easier to clean, so an improved smile will safeguard your dental health for years to come. A new smile will also send a boost of confidence, happiness, and self-esteem that radiates through every aspect of your personal and professional life, making everything from neighborhood barbecues to big presentations at work easier. And straightening your teeth has never been easier: modern braces are thinner, more attractive, and more comfortable than ever, and Invisalign are virtually unnoticeable! 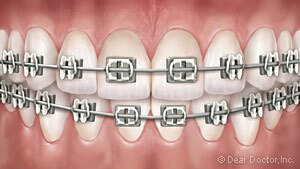 Traditional Metal Braces — This is what most people think of when they hear the word "braces." 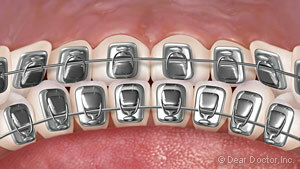 Composed of high-grade stainless steel brackets and wires, metal braces are one of the oldest treatments in orthodontics. They're sturdy, reliable, and offer a cost-effective treatment method that produce results. Clear Braces — Clear braces use the same components as metal braces, with one key difference: the brackets are see-through! This means that clear braces are much more discreet than metal braces, providing an aesthetically appealing option. That said, they're slightly more fragile and can cost more than traditional braces. Invisalign Clear Aligners — Invisalign does away with brackets and wires entirely, instead relying on a series of clear, removable plastic trays - called aligners - to straighten the teeth. The aligners are virtually invisible when worn and can be popped in and out to eat, drink, brush, and floss, which means no one will know you're straightening your teeth, you can still enjoy your favorite foods, and maintaining oral hygiene is as easy as ever. 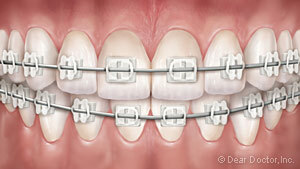 Lingual Braces — Lingual braces work the same way as metal braces, but they're truly invisible to others. Why? They're mounted to the inside (tongue side) of teeth! This makes them completely invisible from the outside, but they're more expensive and take more time to get used to than regular braces. Investing in a new smile is a great choice, and you'll feel the benefits for years to come. Dr. Choonara has been helping patients throughout the Johannesburg, South Africa area achieve better smiles for years, and if you'd like to find out how orthodontic treatment can improve your smile and life, we're here to help. Feel free to call us at (011) 678-8090 with any questions, or schedule an appointment online. We also serve patients in Randburg, Sandton, and Midrand. We can't wait to hear from you!